The “combined” version feature a “clean” version of the Cactus Blossoms performance, free of credits. However, this version is missing the last 20 or so seconds of the performance, which are present only in the standalone version in Part 3. The combined version is missing the establishing shot of Vegas that opens Part 4. Instead, it skips straight to the exterior of the Silver Mustang, with the Cactus Blossoms song fading over the shot (replacing the ambient noise present in the standalone version). The “combined” version does, however, offer a slightly more complete “clean” version of the Silver Mustang exterior shot — in the standalone Part 4, the exterior fades in from the Vegas establishing shot, but the “combined” version features a hard cut from the Cactus Blossoms directly to the Silver Mistang exterior with no fade. The end credits start over the Au Revoir Simone performance about twenty seconds earlier on the “combined” edit, to accommodate the extra credits; the standalone Part 4 has more “clean” footage of the ARS performance. In Part 3, the two men who are hired to assassinate Dougie Jones... who are they working for? Again, I think we're back to the same mystery man who Mr. C speaks with over the FBI computer in Part 2. Maybe Mike really is the mystery man in Season 3? Here's a hell of a coincidence for you in the picture below. My guess is that Mike hired these men to kill Dougie on this day, specifically so Doppel Coop would not have time to create another Tulpa to take his place at 2:53pm. It’s been my assumption that Mr. C ordered the first attempted hit on Dougie. 1. Lorraine hires the hitmen, ultimately on the orders of Mr. C (presumably via Duncan Todd), who plans to have Coop killed as soon as he’s diverted into the switcheroo with Dougie, who Mr. C had manufactured for this purpose. 2. Lorraine’s hitmen fail, so Mr. C instructs Duncan Todd to have her killed, and to make a second attempt at Coop. 3. Duncan Todd sends Ike the Spike, who manages to kill Lorraine, but fails to kill Coop. 4. Duncan Todd gets another chance and forces Anthony Sinclair to attempt to convince the Mitchums to kill “Dougie”, but this doesn’t work. 5. Duncan Todd orders Anthony to personally kill “Dougie”, but this too fails. 6. Mr. C sends Chantal and Hutch to kill Duncan Todd and Cooper. 7. They kill Duncan Todd, but fail to kill Cooper. I believe that Naido/Diane changed the order of things when she threw the switch and the number changed from 3 to 15. I don't know what the difference would have been, but she definitely altered what was supposed to happen. I don't think Cooper showed up where or when DoppelCoop was expecting him, if he was expecting him at all. Even if DoppelCoop knew that Dougie and Dale would trade places (which I'm not certain about), how could he know that Cooper would come out severely compromised and barely functioning? 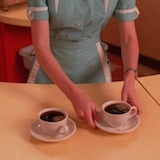 If the true Dale Cooper had switched places with Dougie and been present from that time, wouldn't DoppelCoop focus all of his energies on eliminating him, his greatest threat? This is skipping ahead a few parts, but when Lorraine reports that the assassination attempt has failed, she sends a text message to "ARGENT" in Buenos Aires, not Duncan Todd, not Mr. C. I believe she was working with a third man, in some unknown capacity. There is a direct conversation between Duncan Todd and Mr. C, but never any direct contact between either of them and Lorraine. Jasper wrote: It’s been my assumption that Mr. C ordered the first attempted hit on Dougie. You're definitely onto something. As I've stated previously, Mr. C doesn't lift a finger to take Cooper out, and I have never been able to explain or justify that. Given how hands-on he is in every situation, it's just about impossible to imagine that he would leave that most important of tasks to a couple of goons with guns. About the box in Beunos Aires: If it's a relay device, then I guess it would make sense for her to send texts to Mr. C through it. But, then again, it transmutates into a chunk of gold upon hearing a certain key phrase, so, I'm completely lost when it comes to deducing what that box is or what it's purpose could be. Regarding the phone call, I've always believed that caller to be MIKE / Gerard. Something about the intonation is familiar, but his desire to "be with BOB again" is what really got me feeling that it's him. Mr. C also doesn't kill Todd himself nor does he kill the Warden while he does kill Phyllis and Daria. The reasons why he chooses to contract the killing of Cooper are up to the viewer. The simplest explanation is that Mr. C has business North Dakotab while Cooper is in Vegas. Another explanation is that a head to head confrontation with Cooper is too risky. It's possible he knows Cooper is the only one who can send him back to the Black Lodge forever so he avoids meeting him eye to eye. I can understand Mr. C outsourcing low level assassinations in order to free himself up for more important stuff, but eliminating Cooper would be absolute top priority, wouldn't it? The fact that Mr. C stays well away from him could imply that he is worried about the outcome of the meeting. But how can this be? "I'm not worried Ray -- about anything." If we take Mr. C for his word, then he doesn't worry and he doesn't need. This would give some weight to the argument that he's on a very tight schedule and simply doesn't have time for it, but what he is up to and why it's so time sensitive is anyone's guess I suppose. This is why I wonder if DoppelCoop actually knows that Dougie and Dale have traded places. In Part 3, we see a glimpse of Dougie sitting in the Red Room while DoppelCoop is puking up garmonbozia, just before he passes out. From that glimpse, I guess we're to assume that DoppelCoop thinks all has gone to plan... but we know that things did not go to plan because Naido threw the switch and the wall socket changed from 15 to 3. The other thing that confuses me is why/how Dougie has the ring. Traditionally, Bob doesn't want anything to do with the ring. MIKE is the one who's usually the ring dealer. There is a lot of story missing here, but my thinking is that somehow Mike or one of his operatives got Dougie to accept the ring, then they planned to assassinate him that day to deliver his body to the Lodge. All of this was planned so that at 2:53pm, DoopelCoop would not have the Dougie Tulpa to take his place back at the Lodge. It's all speculation, but, what would have happened if Naido hadn't thrown the switch and Dale had entered the wall socket when it was marked 15? We see Naido gesture signs of death, slashing at her throat, but that's it. Where/when would he have gone, had she not intervened? My guess is that 15 would have been a much later time, whereas at 3, Dale returned very quickly after 2:53pm that same day. Regardless, we do know that Naido changed the order of things and all did not go as planned for Dougie and Dale. Mr. Strawberry wrote: I can understand Mr. C outsourcing low level assassinations in order to free himself up for more important stuff, but eliminating Cooper would be absolute top priority, wouldn't it? The fact that Mr. C stays well away from him could imply that he is worried about the outcome of the meeting. But how can this be? I would not take Mr. C at his word. Richard did...to his detriment. But seriously, I think it's pretty simple. It's either 1) direct confrontation with Cooper is too risky or 2) He's too busy in South Dakota to jet over to Las Vegas to do the job himself. I think the two Coopers being in one place is just too unpredictable. Mr. C broke the rules by even having both of them on Earth at the same time, he’s not going to risk a face-to-face meeting. Mr. Reindeer wrote: I think the two Coopers being in one place is just too unpredictable. Mr. C broke the rules by even having both of them on Earth at the same time, he’s not going to risk a face-to-face meeting. That's strange. I always thought (and still think) that Cooper (aka the good Dale) broke the rule, with some help by Laura Palmer, who spoke these magical words "You can go out now." In a way Laura/Carrie (who was dead and yet alive) made Dale remember he had to leave, and so he went to find an exit. He didn't manage to find a "normal exit," because of the doppelgänger Evolution Of The Arm obstructed that, albeit he found his way out through the floor. In short: he didn't wait (according the rules?) until he would've been traded places by his counterpart out there in the "real world," wherever that may be. The whole issue of how and why Dale gets out of the Lodge is not really discussed very much in this or other forums. All these years the vast majority of Peaks fans believed Dale would be rescued were proven wrong: Cooper was just released at a set time. Or was he? Did Laura have to make some sacrifice in order to have him released? The “You can go out now” phrase also pops up in a few places, interestingly. Obviously Jade says it, giving Dale a flashback. But an offscreen woman says “You can go in now” to Cynthia Knox before she enters Col. Davis’s office, and Jeffries says it to Dale before he travels to 1989.
mtwentz wrote: The whole issue of how and why Dale gets out of the Lodge is not really discussed very much in this or other forums. Well... I would guess that many are still grappling with what they saw. It's very difficult to "make sense of it". After emerging from The Red Room and stumbling around for a week straight, Cooper goes back to The Great Northern and opens a door in the basement using a 25 year old hotel room key. Then he steps into some other realms, eventually returning to the very place where he was trapped for 25 years. Later we see him leave The Red Room again, although when he does so, it feels as though he's actually leaving for the first time. I can't discuss that or what follows because my grasp on it is extremely questionable. It really is so overwhelming, even just reading it! We've all got to keep discussing it on here. Little by little, we'll make some sense of it. I doubt there will ever be a definitive explanation for every single thing, but through collective thought and discussion, we'll understand more and more.